OSDev.org • View topic - Announcing: PonyOS - A hobby operating system for everypony! 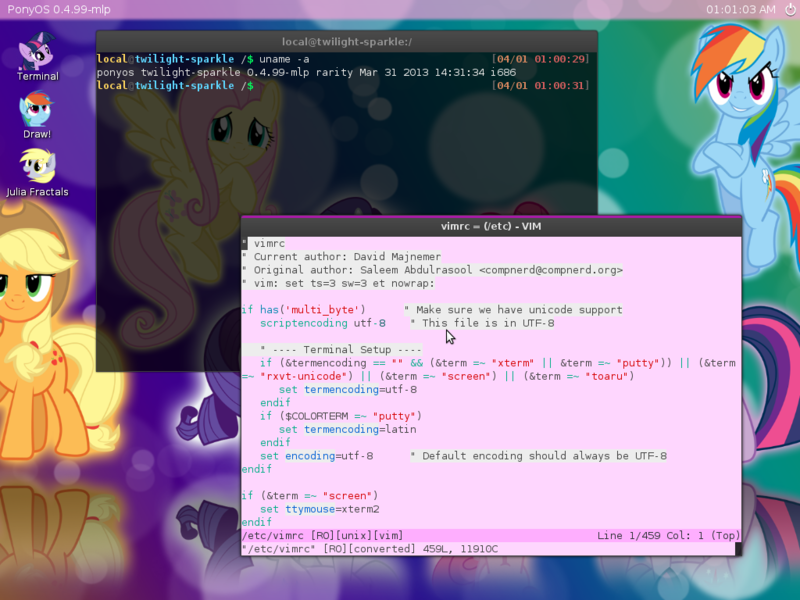 Announcing: PonyOS - A hobby operating system for everypony! Post subject: Announcing: PonyOS - A hobby operating system for everypony! I am happy to announce today the first release of PonyOS! PonyOS is an exciting new hobby operating system for pony lovers everywhere. It comes with great features like a drawing tool and full-featured Xterm-compatible terminal. You can find downloads, including a disk image bootable in QEMU, on our website! Note: No warranty of stability, usability, or support is provided for PonyOS. Those who understand Unix are doomed to copy it, poorly. I time all of my pranks by UTC. Is he? This is an international forum, thus UTC is perhaps the best time to judge by. And by that, he's spot-on. Anyway, being based on とあるOS (which we've seen some amazing screen shots from) it works, thus I wouldn't even consider it a joke. Well, now it's my turn to judge, I guess. とあるOS is really impressive, considering the GUI and that you've managed to port vim. The lack of network support is a pity, but I think, simple TCP support is way easier than what you've accomplished so far. I was judging it based on his location -- if he prefers UTC, then no argument from me...and it was pretty good. Is PonyOS a Linux distribution? No! PonyOS uses its own kernel, built from scratch. I am the creator of Isaac OS based on debian and LICENSED. My eight years old daughter's gonna love this!